In 2003, British publisher Telos published the Doctor Who novella The Cabinet of Light, which co-starred two new characters, a pair of time-travelling "fixers" named Honoré Lechasseur and Emily Blandish. Shortly after, Telos announced they would publish a range of spin-off Time Hunter novels starring the same two characters. Despite a positive reaction from readers, overall sales were lower than expected, and the range ended in 2007 after 4 years and 11 novels. 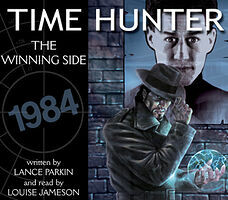 In 2008, publisher and audio producer Fantom Films announced a new line of audio readings of the Time Hunter novels, and over the next 4 years released all 11 of them (plus an adaptation of The Cabinet of Light which for copyright reasons was "Doctor free").